Solomon Tobias was born in Charleston, South Carolina in 1790. 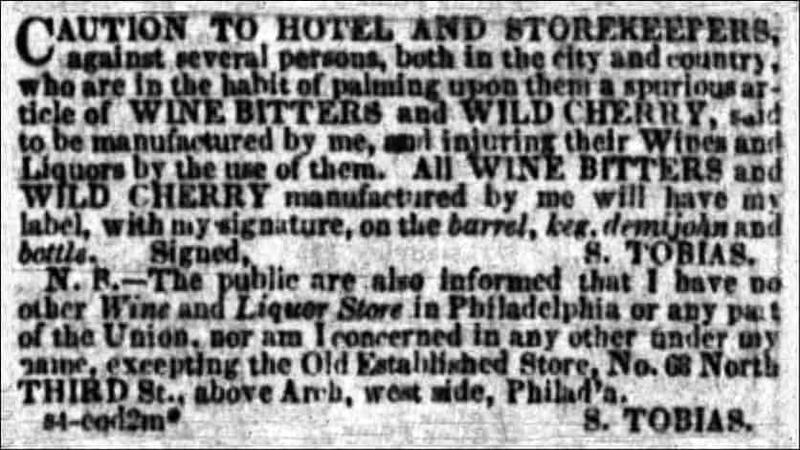 We know that he was still in Charleston in 1818 as there is “a petition of young Solomon Tobias, Charleston, for an appointment in the army, July 4, 1818.” Later Tobias advertising states that he established his wine and liquor business in 1821, presumably in Philadelphia, Pennsylvania where the Tobias wholesale wine and liquor business was carried on for many decades. We first see a hard address and reference of S. Tobias as a Manufactory of Wine Bitters located No. 93 North Fifth Street in Philadelphia in 1837. 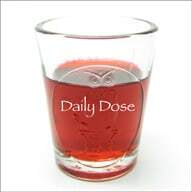 He also took out newspaper notices the same year cautioning ‘Tavern Keepers in the Country’ to be wary of spurious Wine Bitters that were being sold as his product. 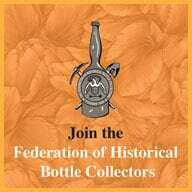 He stated that he continued to label all of his barrels, kegs, demijohns, and bottles with his written signature, S. Tobias. He was probably using an unembossed pontiled cylinder bottle at this time for the bitters. 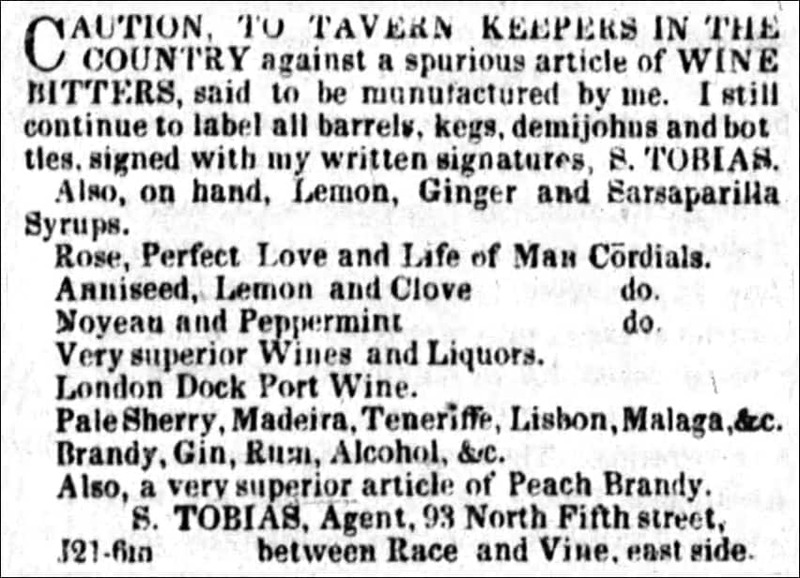 In other 1837 advertising (below), Tobias was selling Stoughton Bitters, Lavender Bitters, Tansey Bitters, Brandy, Wines, Liquors and Syrups along with his signature Tobias’s Wine Bitters. He would heavily advertise his Wine Bitters up until 1850 or so. Looking at the art above, you can play “I Spy” and see a patron entering one of the two open entryways at which a straw basket and wine cask are displayed across from a large-cask shaped sign which reads “S. Tobias No. 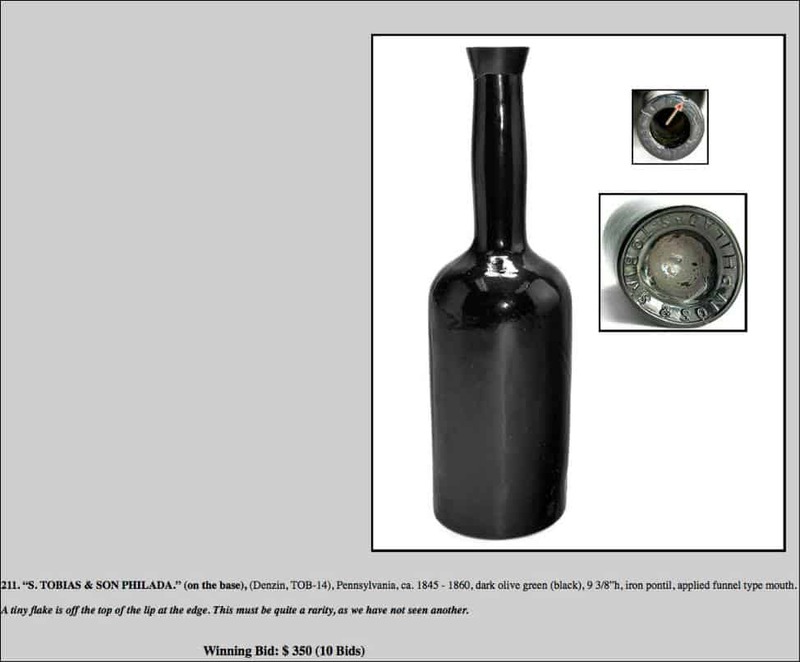 68 Importer & Dealer in Wines Liquors Cordials and Syrups.” At the other entryway, a laborer rolls a cask out the door near a worker entering the cellar. Within the store, the backs of a patron and a clerk are visible in the rear of the store in which shelves of liquor bottles, straw baskets, wine casks, and barrels are displayed on shelves, the floor, and the open display window. Other boxes, bottles, casks, and barrels are visible at the upper floor windows. Barrels and boxes, one marked “S. Tobias” line the sidewalk, near a street lamp in front of the store. 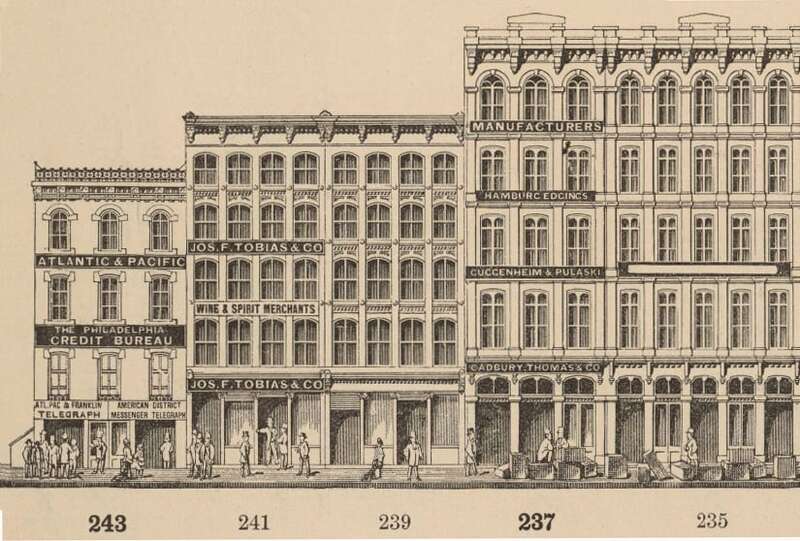 The print also shows partial views of the adjacent businesses and the signage adorning the storefronts of Charles M. Schott, dry goods (66 N. 3rd St.) and Scattergood & Whitall, druggists’ glassware (70 N. 3rd St.). A clerk is visible working at a table through the doorway of Schott, and a pulley and boxes are visible within the open doorway of Scattergood & Whitall. Tobias became a tenant within the No. 68 North Third Street building starting in 1845 and renamed his business S. Tobias & Son in January 1847. 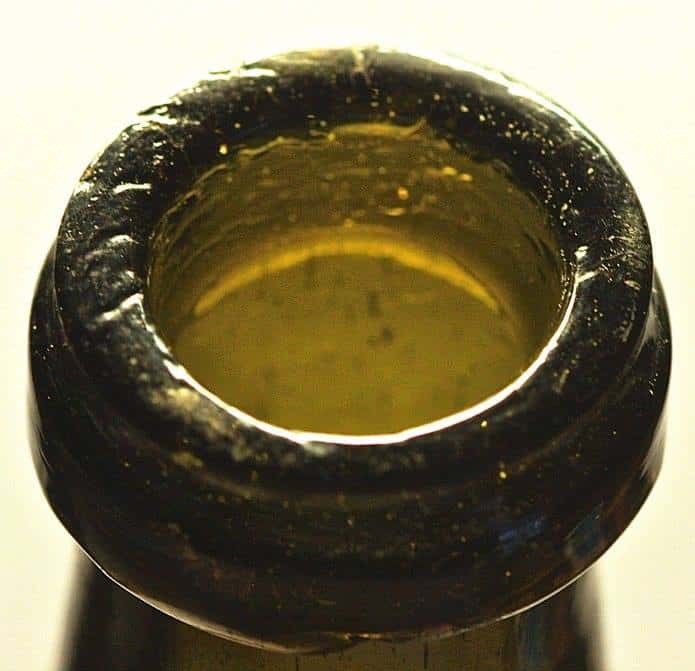 This would have been the earliest date for Robert Biro’s bottle as the base is embossed ‘S. 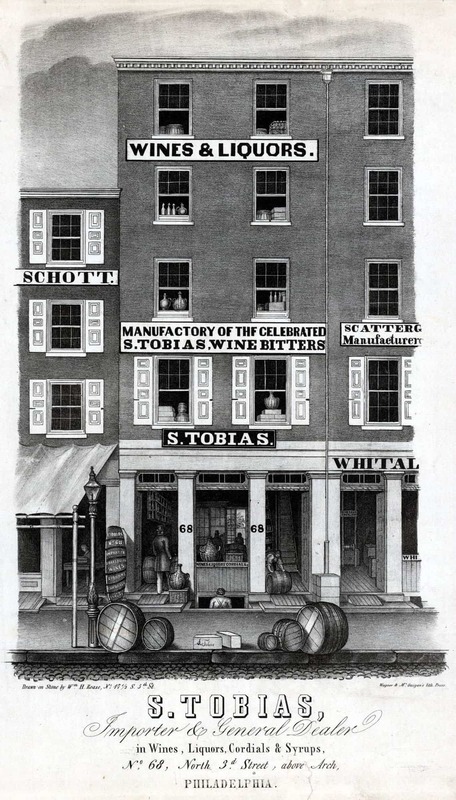 Tobias & Son.’ Advertising would continue through 1849 or so for the bitters. 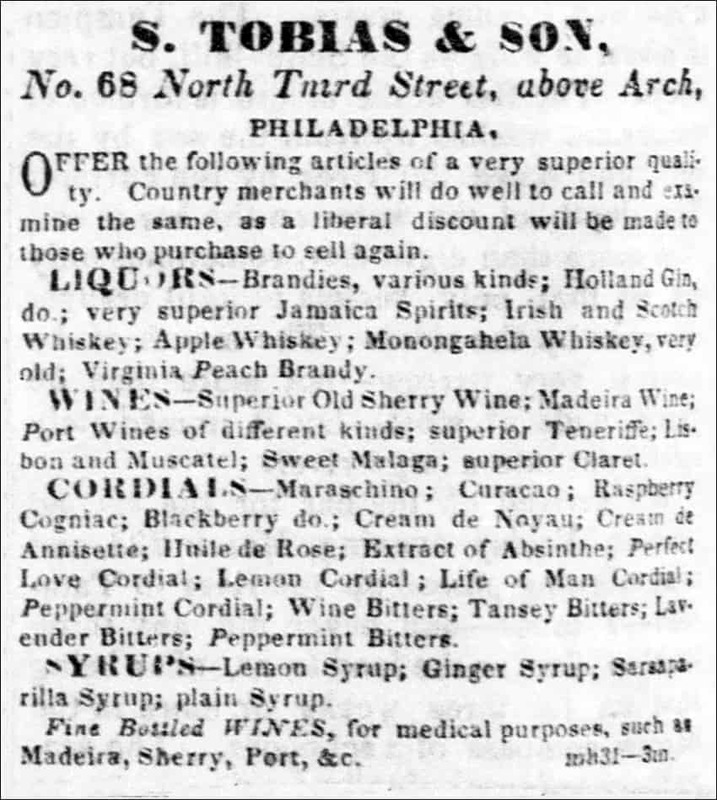 There is also this fine full-page advertisement below in the 1848 Philadelphia Wholesale Business Directory for S. Tobias & Son showing the full front of their new store at No. 68 North Third Street, above the Arch. 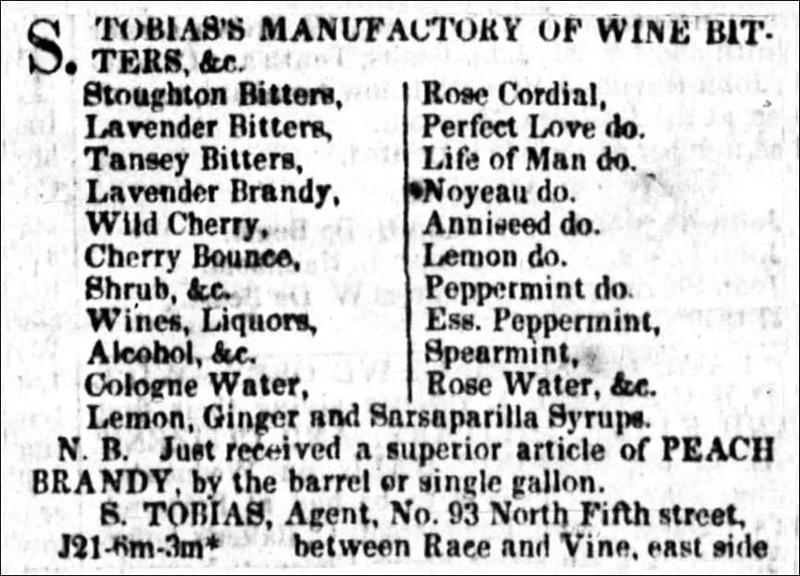 They are noted as Importers and General Dealers in Wines, Liquors, Cordials and Syrups and also Manufacturers of the Celebrated S. Tobias’s Wine Bitters, Wild Cherry, &c. On the ad, the S. Tobias stands for Solomon Tobias. His son was Joseph F. Tobias. 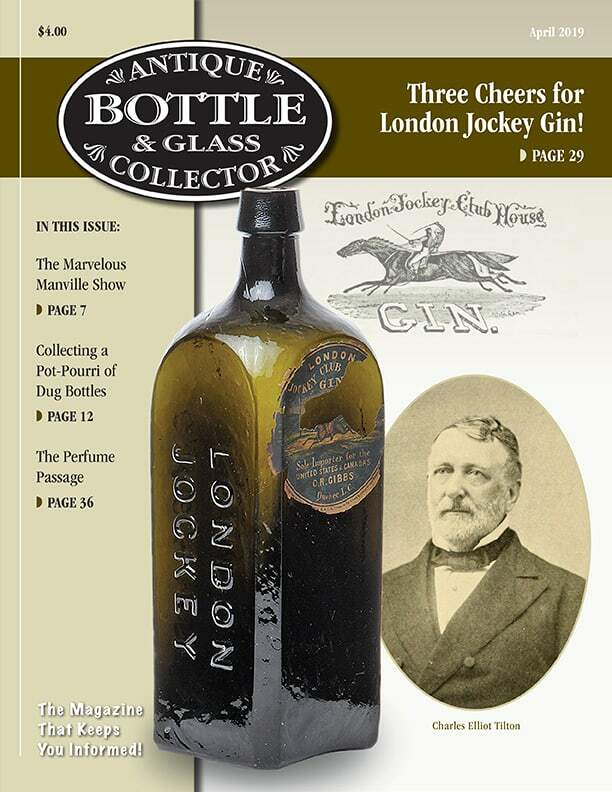 They offered a wide range of liquors, wines, cordials and syrups of a very superior quality and said that Country Merchants will do well to call and examine their stock and will offer a liberal discount to those who purchase and agree to sell again. 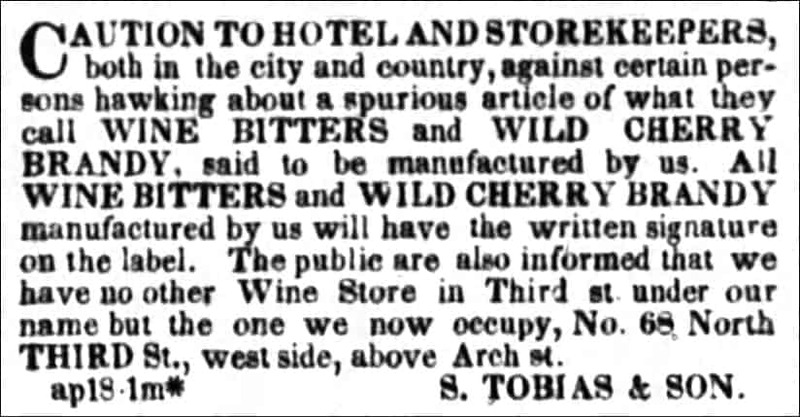 Here is an 1849 advertisement where S. Tobias & Son were selling S. Tobias’s Wine Bitters to the western gold rush market. 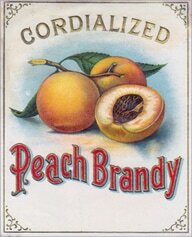 In 1860 or so, the liquor business was renamed Joseph F. Tobias & Company. 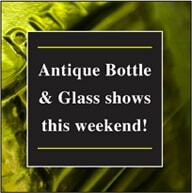 Joseph F. Tobias and James Carstairs Jr. were partners and importers of wines, brandies etc. located at 206 and 208 S. Front in Philadelphia. Solomon Tobias was listed as living at home so he must have retired. He would pass on in 1868. 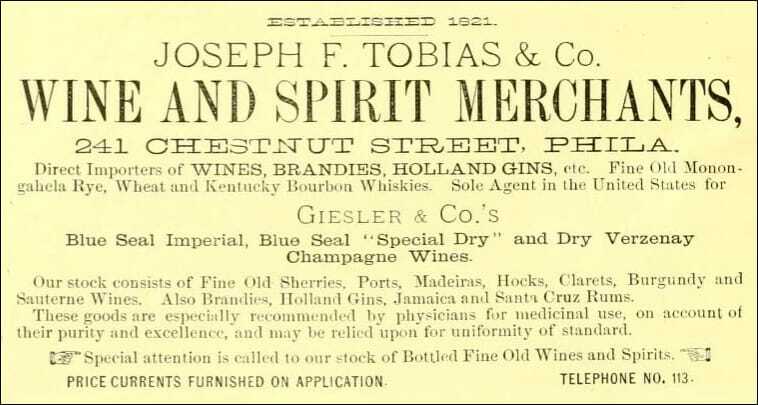 The full-page advertisement below from the 1878 Philadelphia City Directory is for Joseph F. Tobias & Co. Wine and Spirits Merchants, No. 241 Chestnut Street, Philadelphia. 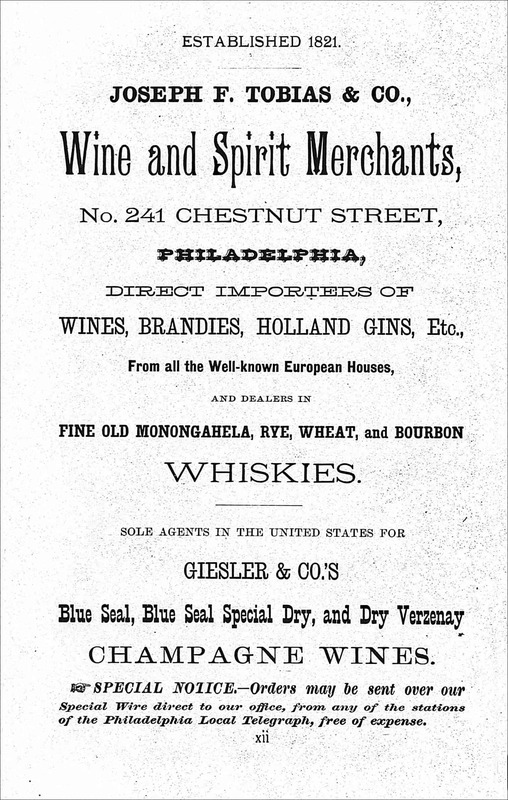 They were noted as direct importers of wines, brandies, Holland gins and dealers in fine old Monongahela, rye, wheat and bourbon whiskies. 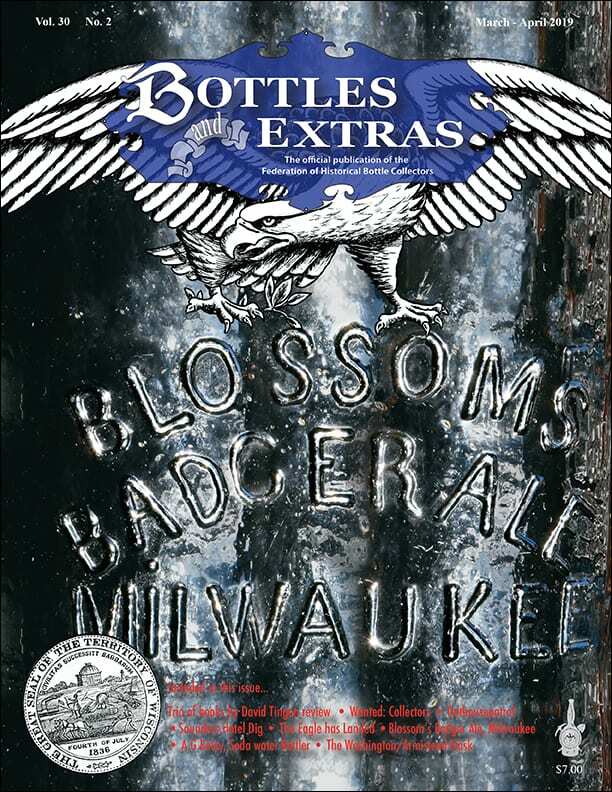 They were also the Sole Agents in the United States for Giesler & Co’s, Blue Seal, Blue Seal Special Dry and Dry Verzenay Champagne Wines. 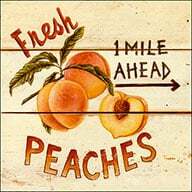 It says he was established in 1821 which means when his father Solomon Tobias started the business. Joseph was born five years later. 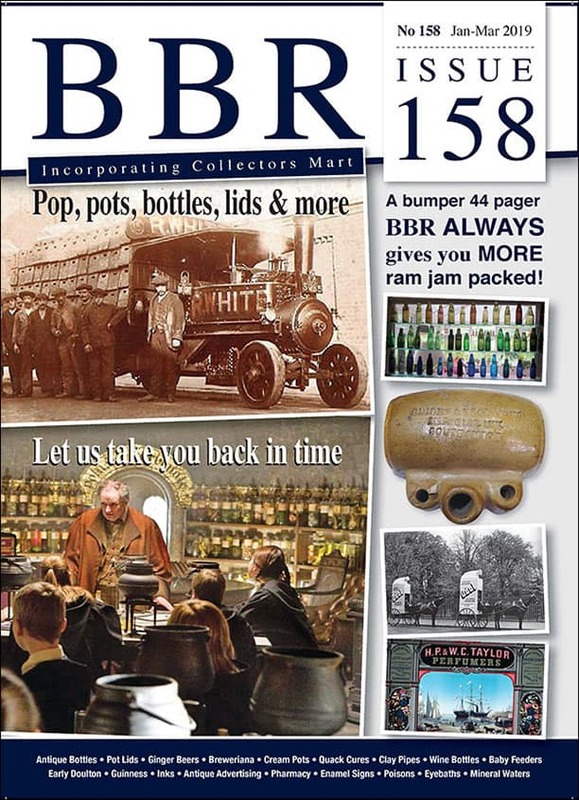 Note that there is no listing for a bitters product. Here below is a section of a panoramic view of Chestnut Street in Philadelphia. You can see the Joseph. F. Tobias storefront. Again, no special bitters sign. Jos. F. Tobias & Co. would continue in business until 1893 or so at the 241 Chestnut address though at some point he moved next door to 237 Chestnut and took on new associates, Mahlon Hutchinson and Edward P. Vogele. Joseph would die in 1902. He spent his final years living at the Aldine Hotel. 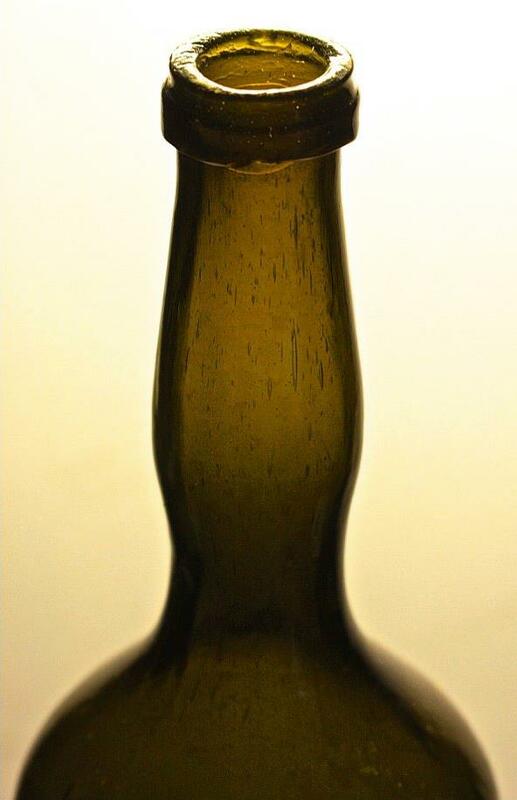 So, is this bottle for the Celebrated Tobias’s Wine Bitters? Probably so. We will not know for sure until a labeled example shows up. 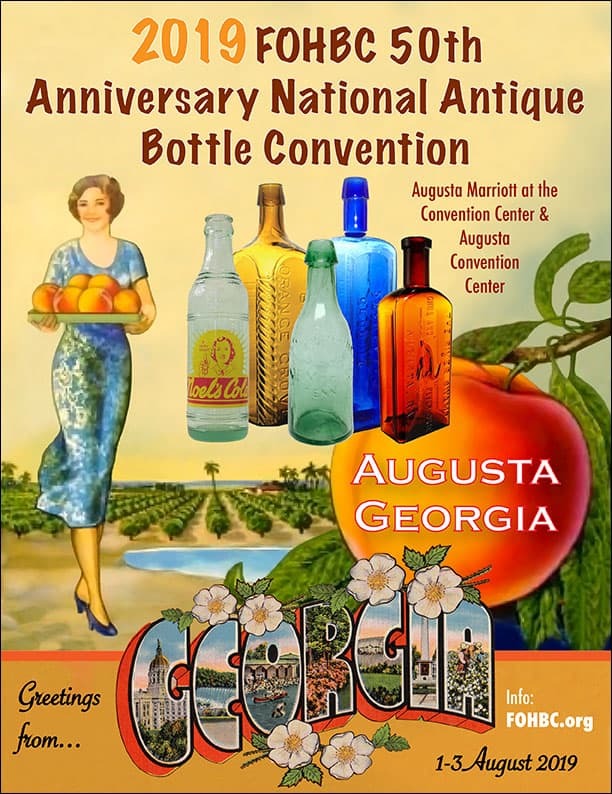 This entry was posted in Advertising, Bitters, Cordial, Digging and Finding, History, Liqueurs, liquor, Liquor Merchant, Spirits, Syrup, Whiskey, Wine & Champagne and tagged Aldine, bitters, Celebrated, Charleston, Chestnut, Cordial, Edward P. Vogele, James Carstairs Jr., Joseph F. Tobias, ladies leg, Lavender, liquor, Mahlon Hutchinson, merchant, Pennsylvania, Peppermint, Philadelphia, pontil, Robert Biro, S. Tobias, Savannah, Solomon Tobias, son, South Carolina, storefront, Tansey, wholesale, Wild Cherry, Wine. Bookmark the permalink.